Long Island fighter Taylor Costantino has had a string of bad luck in trying to make his MMA debut. The talented fighter (and Sambo tournament gold medal winner) has had several opponents pull out of matches at the last minute. Then, this past June, at the Asylum Fight League show, Taylor was wrapped up and ready for his fight when the entire event got cancelled halfway through due to moisture accumulation on the fighting surface. Still, the Team Renegade member perservered and continued to train hard as he awaited his chance to fight his first mixed martial arts bout. He finally got that chance last Saturday at Cage Time 4 in Pennsylvania. Not surprisingly, Taylor dominated, unleashing his pent up frustration enroute to a commanding 2nd round submission by way of kimura. I train with Taylor at Team Renegade under the watchful eye of trainer Anthony Sansonetti. It's a fun place to train and we have a good time as I annoy him (and everyone else) with my constant smack-talk. But when we roll and spar, Taylor is all business. He's very strong physically, has good punching power and excellent submission skills, which is pretty amazing considering that he's just 19 years old and has only been training for little more than a year. His dedication to training and his hard work paid off big in his MMA debut. Congrats to Taylor Costantino! Congrulations also go out to Anthony Sansonetti, who is the best coach I've ever had the pleasure of training with. Anthony is not only a skilled competitor himself, he truly loves teaching, and it shows in the success of his students. 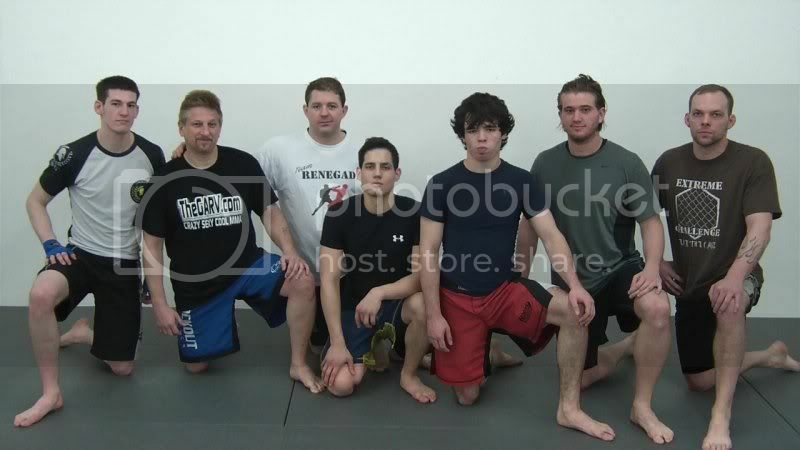 You will be hearing lots more about Team Renegade in the future, because Anthony is training his guys to be champions. Speaking of which, Ben Syers, who trains under Anthony and helps run some of the classes, is the reigning and defending Evolution Fighting Championship welterweight champ, and he'll be defending his tile one month from now, on August 27. Taylor is also fighting on this card, so if you want to see how Team Renegade rolls, here's a great opportunity. Here is the video of Taylor's MMA debut as shot by "Shaky" Matt Dixon.